Cooking mung beans is one of the many Filipino dishes that I really enjoy doing. It's a simple home cooking recipe that I'd like to share with you in this post. Get your cooking gears on! Let's start cookin' like pro's! 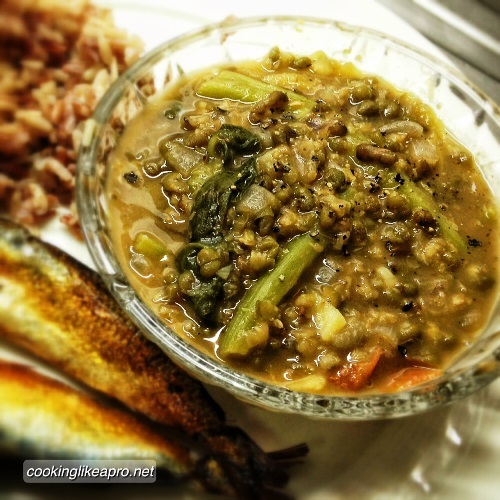 Cooking mung bean (munggo in the Philippines) is an easy recipe. The challenge in cooking mung beans, particularly this dish is the time you need to cook the mung beans; and a particular ingredient that gives this recipe it's distinct flavor - shrimp paste. Ready to cook? Mung beans are the small very hard beans that turns into long sprouts when immersed in water for days. Until they are bean sprouts, cooking mung beans require a lot of boiling time. Eating mung beans are often misconstrued to be unhealthy. On the contrary, mung beans are nutritious legumes which you and I can benefit a lot from. Cooking mung beans one or twice a week is good for our health and our tummies. Here's the full post for the Mung Bean Soup with Ginger variation. 1. Put the mung beans to a boil until its green cover separates from its pods. It may take 30-45 minutes of boiling time under medium to high heat. 2. When the mung beans are cooked, crush the soft beans with a ladle. Keep the bean soup together with the beans. Set aside. 3. In a hot pan, saute' a portion of the crushed garlic. 4. Toss in the pork when the garlic turns golden. 5. Saute' the pork and the garlic until the pork is cooked. 6. Season the pork with shrimp paste and pepper. Set aside. 7. In the same pan, saute' the rest of the garlic. 8. Add in the onions when the garlic turns golden. 9. Add in the tomatoes when the onions are slightly cooked. 11. Add a little hot water; lower the heat and cover the pan. 12. When the tomatoes begin to juice, add in the flavored pork. Stir well. 13. When the ingredients are all mixed up, raise the heat to medium. 14. Slowly add the beans soup into the mixture. 15. Let the soup boil. 16. Season with fish sauce and pepper, as desired. 17. Serve with hot rice and fried fish. Enjoy cooking mung beans at home. More so, enjoy this dish with fried fish or garlic pork viand. Remember me when you prepare this meal for your family! yay! looks so yummy. :) weee.. nice recipe sis ahh.. i havent tried this one yet and indeed a must try.